I didn't receive my verification email. What do I do? If you registered for a MINDBODY account but haven't seen your verification email, you can easily resend it. You'll need to register a MINDBODY® account when using the app for the first time. 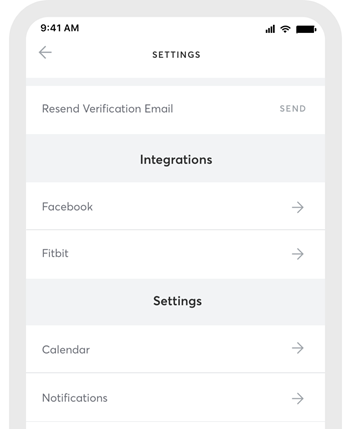 When you sign up for the app using your email address, we will send you a verification email that syncs the MINDBODY app with any existing profiles you have used at MINDBODY businesses (if any). Once synced, you can access your passes and book services directly from your smartphone. If you can't find your verification email, try resending it. You might also double-check the email address you used when signing up. To start, click on the Profile icon at the bottom right corner of your screen. Next you'll tap on Settings. Then Resend Verification Email. Now check your inbox for the verification email—it should arrive very shortly! Note: To keep the MINDBODY app as secure as possible, the verification email will expire after 72 hours. If the email expires, follow the steps above to resend the verification email. I waited for quite a while. Why am I still not receiving the verification email in my inbox? Email providers occasionally misidentify MINDBODY emails as spam. As a result, your confirmation email may end up in your Junk/Spam folder, or not arrive at all. If you can't find the verification email in either of these folders, log into your email account and add confirm@mindbodyonline.com to your address book. You can then resend the verification email from the MINDBODY app. What if I signed up for the MINDBODY app with the wrong email address? Don't worry, mistakes happen! If you signed up with the incorrect email address, you'll need to create a new MINDBODY account with your desired address. Make sure your new account uses the same email address and name you use with local businesses—this is necessary to automatically sync your accounts.